Sugar delivers unmatched flexibility across every aspect of your CRM deployment. 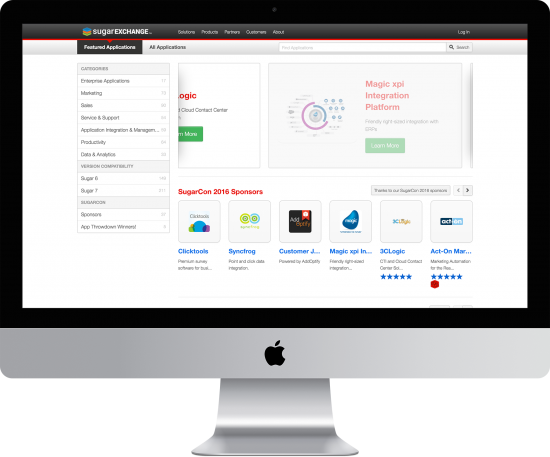 Unlike other CRM providers with their proprietary platforms and rigid deployment models, SugarCRM provides the freedom to deploy Sugar in a manner that best suits your business. Optimize all layers in the technology stack to match your infrastructure requirements. Select from a variety of deployment models ranging from true SaaS to On-Premise installations. Future-proof your implementation with a CRM platform that will allow you to evolve in an ever-changing business landscape. Discover a Different Kind of CRM and see how Sugar makes customer relationships extraordinary in this short video demo. Rapidly build custom objects from scratch or combine existing and custom objects into a brand new application or even perform code level customization. Leverage existing Sugar objects such as Contacts, Accounts, Cases, and Opportunities to build a new module. Create an unlimited number of custom fields and modules to build new applications, which interoperate seamlessly with all Sugar modules and CRM platform tools. Use simple drag-and-drop editors and formula builders to design dynamic solutions. Create custom fields, hide unused fields and customize to create calculated, dependent, and dynamic fields. Tailor the look of each Sugar screen. Define roles and control access for various users. 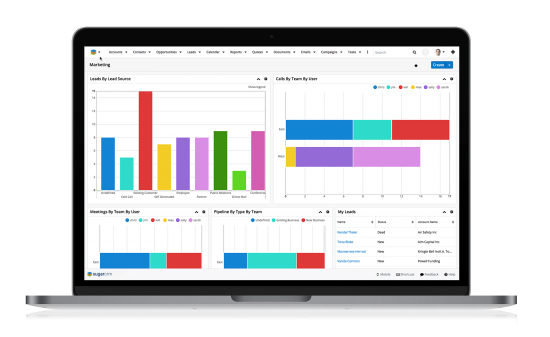 Sugar's real-time reporting lets you rapidly click and deploy reports on business performance analytics across the entire business. Executive dashboards provide a one-page window into your business. Uncover opportunities by drilling down to underlying data right from your dashboard or report. Incorporate business logic throughout the user experience. Automate decisions and routing with business rules. Automate your day-to day-tasks like managing approvals, sales processes, call triaging, and more. Use powerful graphical tools to route approvals, assign tasks, update records, change alerts and discount approvals, monitor account activity and more. Make your teams more productive and responsive by designing workflows and implementing them in the Sugar platform. Sugar partners have developed hundreds of extensions, integrations, and custom applications for the Sugar platform. Explore commercial extensions on SugarExchange. To build your own extensions, Sugar provides a library of no-cost standard APIs, available with all editions. And, since Sugar uses open web technologies and an open platform, there are literally millions of developers who can support you and help you build the solution you want. Sugar has the unique capability to run on SugarCRM's cloud (Sugar On-Demand), on your own technology stack that you manage (Sugar On-Site), on public cloud or a Sugar partner cloud. Sugar’s database architecture makes it possible to move your data from one deployment option to another if your business needs change. Whatever your choice, with Sugar you're in control. Integrate Sugar with marketing automation, inbound marketing, relationship analytics, incentive management tools and more. Equip your sales teams with relevant financial information from your ERP and business intelligence applications. Easily store your customer emails, contacts, meetings into Sugar from your email client using out -of-the-box plug-ins. Build interactive spreadsheets, mail merge Sugar customer data into documents like letters, invoices or license agreements. Develop custom plug-ins to integrate with wide variety of back-office and front-office business applications. Provide field teams with customer data and other information across any device even without connectivity. Easily find and edit the information you need using a native Android and iOS client that is optimized for the device in your hand. Configure your mobile clients branding, distribution, local storage and security according to your specific business needs. Use Sugar throughout the world for your distributed workforce. Out of the box, Sugar supports 35 languages with 80 more available in language packs, so your global teams can work in virtually any preferred language. Sugar’s cloud options span five continents, or deploy Sugar anywhere on your own technology stack.